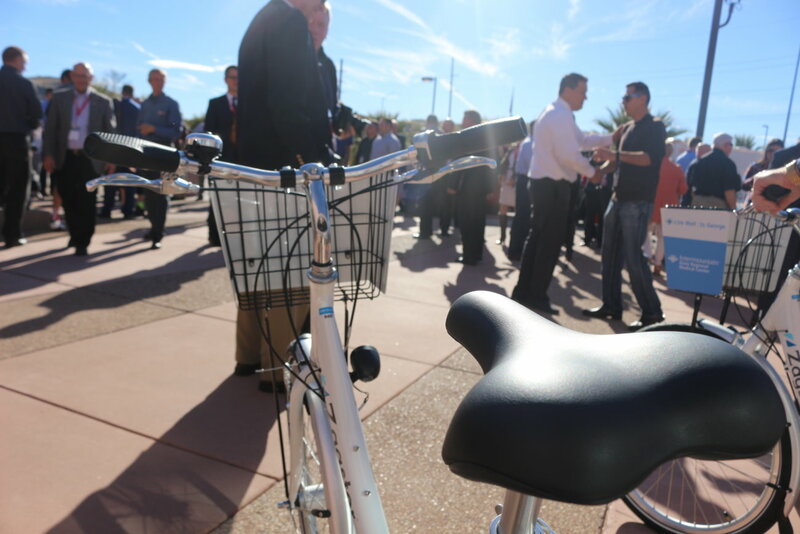 ST. GEORGE – A new bike share program that launched in St. George Thursday is being touted as an affordable and fun way to get around town while promoting alternative transportation and healthy physical activity. 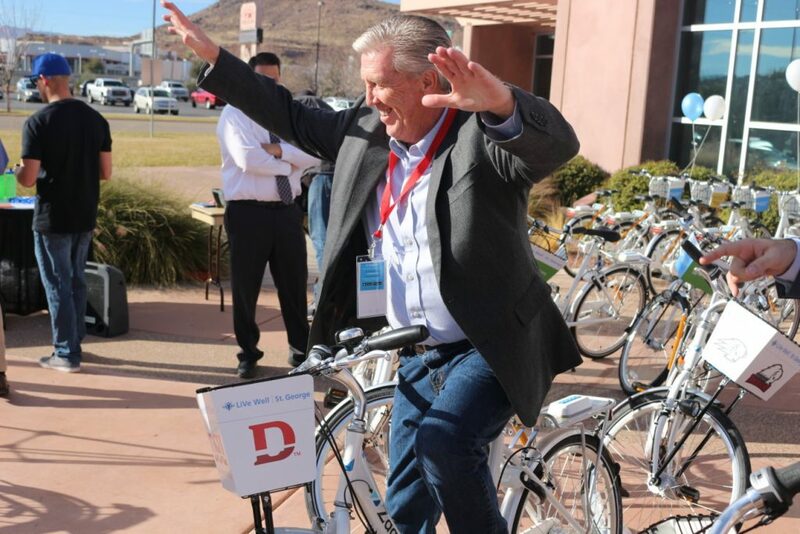 St. George Mayor Jon Pike announced the official launch of the LiVe Well St. George Bike Share Program at the Dixie Center St. George Thursday afternoon. 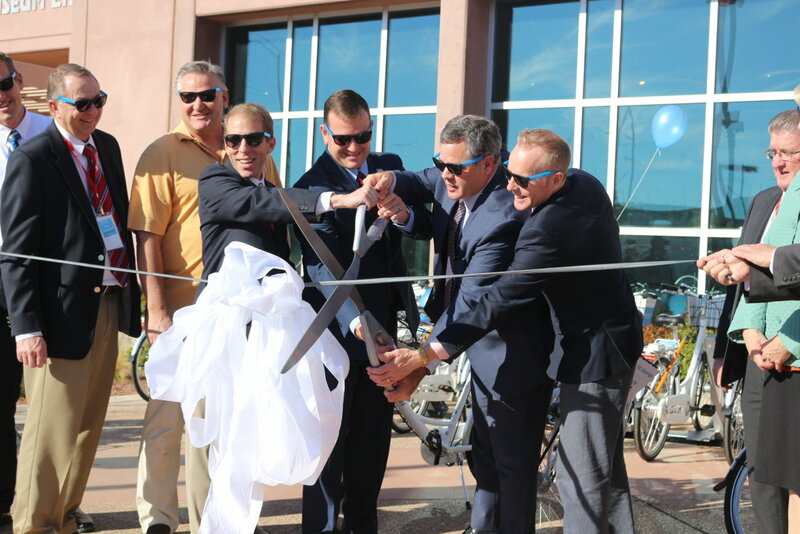 The launch was marked with the cutting of a bike tire tube instead of a ribbon along with a quick bike ride around the parking lot. 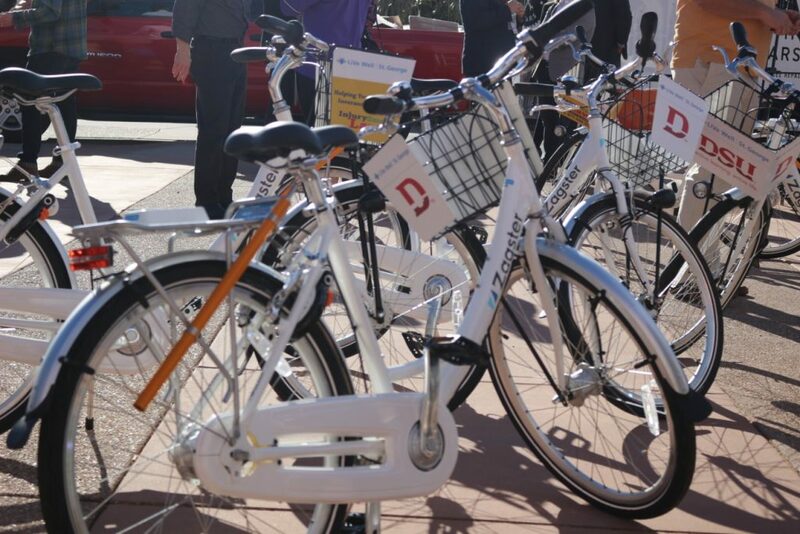 The program, provided though the bike share company Zagster, includes 10 bike share stations and a total of 55 bikes within 3.5 miles of each other between the black hills on the east and west side of St. George, Pike said. Bike share stations will be located near trails, Suntran bus stops, lodging/housing complexes and commercial and institutional centers. In addition to the Dixie Center St. George, other stations include among others Dixie State University, Dixie Regional Medical Center and Thunder Junction All Abilities Park. 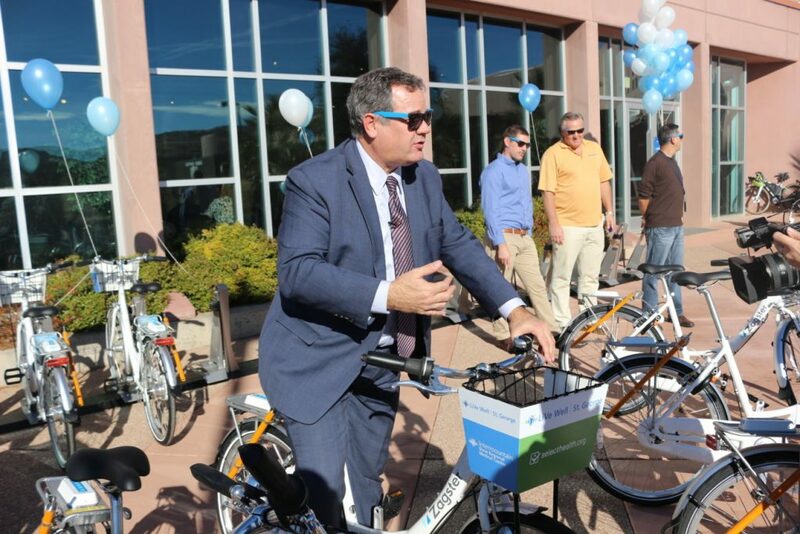 “We’ll be able to provide bikes to university students, to our residents who just want to get from point A to point B quick and for visitors, tourists who would like to tie into our trail system,” Pike said during the program launch. The program is set up through a public-private sponsorship. 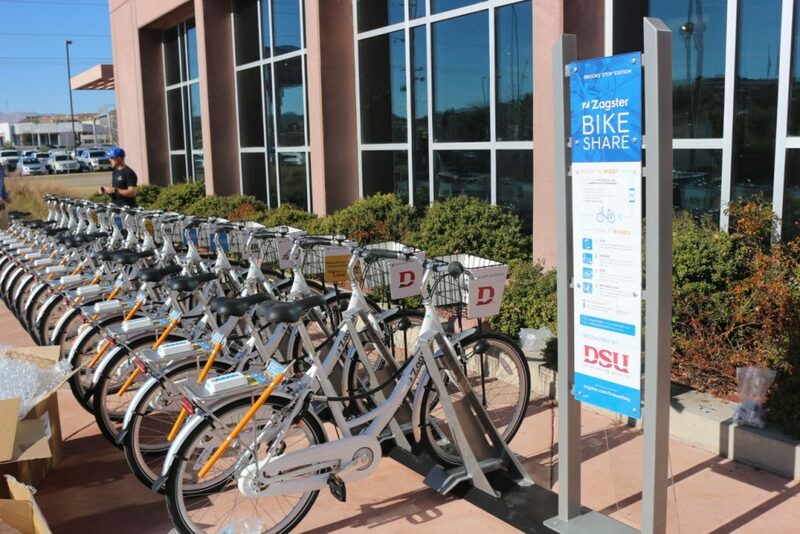 Intermountain Healthcare’s Dixie Regional Medical Center and SelectHealth are sponsoring five of the bike share stations with others sponsored by Dixie State University, Washington County Convention and Tourism Office, Zagster and the Brad Harr & Associates personal injury law firm. Mitch Cloward, administrator of Dixie Regional Medical Center, said the goal of Intermountain Healthcare’s participation in the partnership represents a commitment to helping people live the healthiest lives possible. 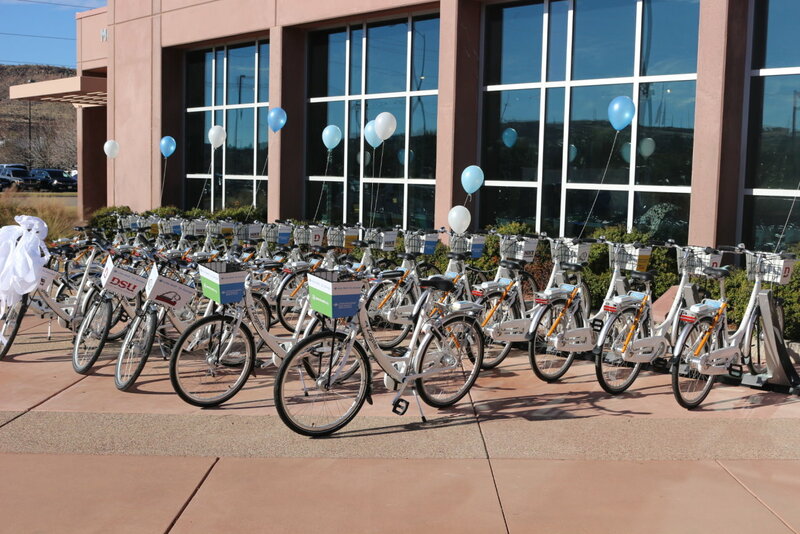 “I hope these bikes help keep people out of the hospital,” Cloward said with a laugh. In relation to Dixie State and the bike share use, Pike announced that plans are in the works to build either a tunnel under or a bridge over Interstate 15 at 400 South for pedestrian- and cyclist-use only. The project is anticipated to start in the coming year and run around $2.5 million. The project will help to establish a better east-west connection within the city for university students and others, Pike said. Zagster, the company behind the bike share program, was chosen by the city to provide the service to residents and visitors based on the affordable program cost, lightweight and rider-friendly bike design, ease-of-use and system-scalability, according to a news release issued by the city. Zagster has launched over 200 bike share programs across the country, Greenstein said, adding that they have been very successful to boot. 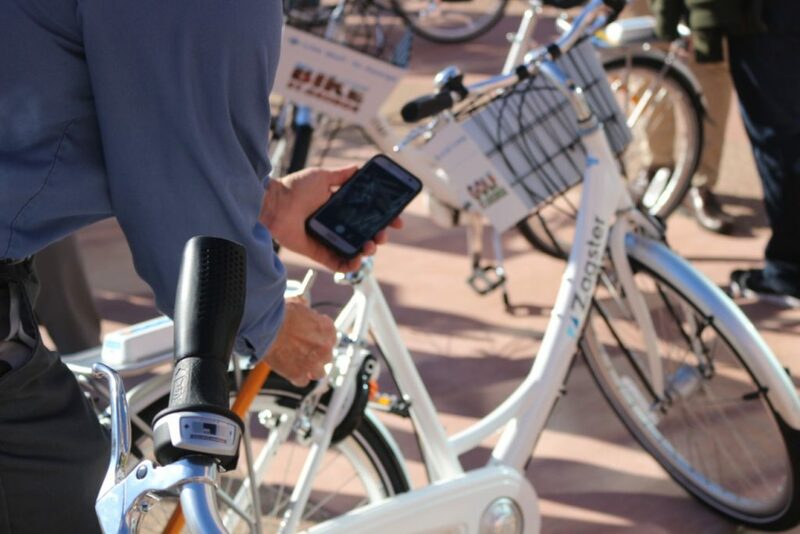 The bike share program is app-based, meaning individuals who rent one of the bikes will do so through the use of a smartphone. On any Apple or Android device, download the Zagster app and create a profile. Search the app for St. George to find station locations near you. At a station, enter the bike’s number into the app and tap “Start Ride.” You’ll get a unique code to open and close the lockbox. Use the key from inside the lockbox to operate the U-lock that attaches the bike to its station. Be sure to shut the lockbox before you ride. 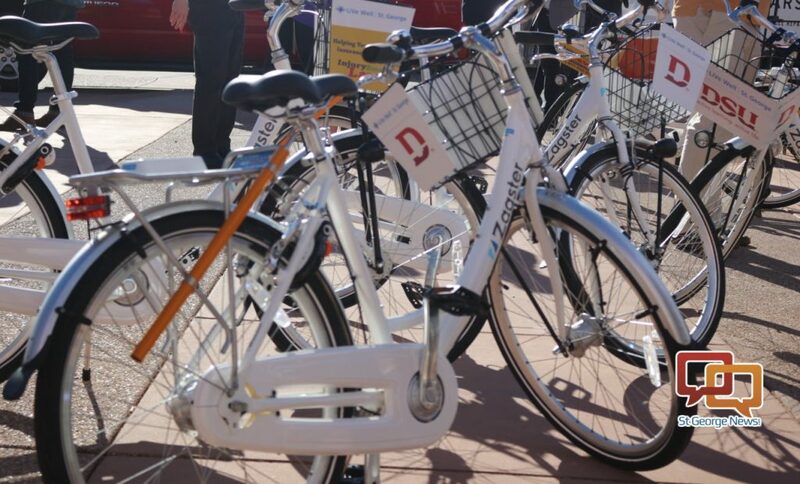 Mortensen introduced the Zagster bike share program to the St. George City Council in August 2017, with the city and Intermountain Healthcare announcing the program’s adoption in November 2017. Zagster works with the communities where it operates to keep bikes affordable in order to encourage use, Greenstein said. For those who just to pay as they go, it’s $1 per 30 minutes of use. Annual memberships are offered at $30, with a student version offered at $15. The city is looking to add new sponsors, Pike said, adding that he wants to see the program double in size by the end of the year. Great, another socialist idea that should of been trashed, they instead started 2.5 million really for a friggen bike share. They say their conservative here. Would of fooled me, sounds like a bunch of so called socialist Mormon good old boys running the show instead. What a complete waste of money, just like their electric theatre debacle these stupid moron Mormon city officials. Might as well call themselves Mormon communists socialists instead. Sounds like to me that you’re being a little jealous over this. Look religion has nothing to do with politics. Just cause there are a lotta Mormons here doesn’t mean what you said it means. In the end people are people and people don’t be bitter. Be better. What a likable person you must be. Do us all a favor and stop commenting. Thank you. The annual dues and rental fee’s will pay for this program, and I expect that it will be a great program since it will be managed by the private sector. Great idea! Really? Why do some people get so caught up in ism’s?? Do you drink water, use utilities, drive on a public road??? IT’s all about creating a better living environment . The entire western united states would not exist had it not been for your so called “socialist ideas ” of Railroads and water not to speak of the public highway system. Oh, do you eat beef…yep once again subsidies by public lands.. Fire … police, school , libraries.. Thank goodness not everybody is as selfish and self indulgent. NO I am not Mormon.. but i do like some of their ideas that truly make this world a better place for all of us to live and enjoy. Mormon good old boys are conservative, but only when it comes to spending their own money. With our tax dollars its a free-for-all of pet projects, kickbacks, and on and on.